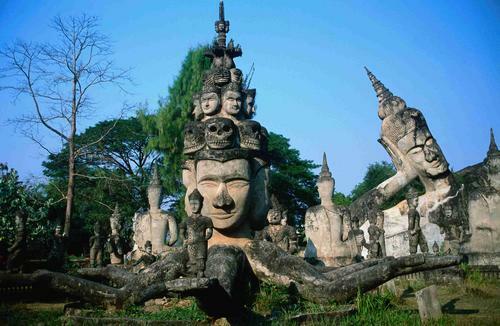 The Buddha Park or Garden Statues (1958) is near Vientiane, Laos. This is a huge sculpture garden designed and built by a priest which was started in 1958 and continues today. The concrete sculptures depict almost all Buddhist and Hindu deities and are dominated by a colossal reclining Buddha. Fashioned by a purported holy man, the sculpture park was created to spread his beliefs and to reveal to mankind his ideas about the universe.